A new report from the US makes clear links between better biking and fighting climate change. It’s worthwhile to read and share. It’s great news to see the changes in the Viaduct bike lanes occurring at long last! Since it’s inception in 1992 by Metro, there were some shortcomings in the eastbound travel, with a pinch point at the entry curve, and the challenge of going across the exit ramp to the Don Valley. Despite the historical #1 ranking of the Viaduct bike traffic counts, the nudges to change things weren’t enough to get the City beyond a stalled inert mass. But the ward29.ca bike group in the land of Case Ootes, (aka the Ootesback) took up the cause and in a report spearheaded by Luke Siragusa (on their website) detailed the problems in a way that the City could not ignore, though again, inertia prevailed. After presentation to the City at TCAC 1.5 years ago, a commitment was made to repaint the problem areas for last November, but it didn’t happen. Now, it’s being done ahead of Dan Egan’s commitment for this July. It is really exciting to see this occurring to improve a vital cyclists gateway into the city core, and let’s fermentedly hope that the remaining improvements to Bloor, can make such a big difference and also can happen soon. Thanks to Tom Flaherty and other 29bikes members for helping this happen! Thur. June 10, 7 p.m. Directed by Alan Kohl, 2008, 74 minutes. Alan Kohl’s documentary Roadsworth: Crossing the Line is about a Montreal stencil artist’s clandestine campaign to make his mark on the city streets. After all, who owns public space? A panel discussion will follow on the topic of bike culture, with Greenspiration’s Angela Bischoff; Most Tenacious Cycling Advocate Award-winner Hamish Wilson of Take the Tooker, Michael Lewis Johnson of Streets are for People – and YOU!. Another great day for a great big bike ride for Bloor bike lanes. Thanks to all those who rode; and to those who helped out, including Clay and Paper who helped with the spectacle, and musicians Wayne Scott, Michael J trumpet man, Richard Underhill, the percussion group at Christie Pits and a Kensington-based band at Ave. Rd. Also new this year were Bells on Bloor T-shirts with the simple slogan Bike Lanes on Bloor on the back. There’s been some controversy within some circles and troglodytes about putting bike lanes on our arterials, often the direct routes in our core. But direct routes, and in a good linked network (not a patchwork), are the clear way to provide real civic respect for cyclists, as we don’t need to be shunted up, then down, though yes, the side roads are often a nicer trip for some of us, some times. Bloor St. also has the benefit of having the subway, and increasingly in this mayoral campaign, and the larger Class C EA study, we must think of how bike lanes can help our subway. The simple way is that if we had safer biking, and in a direct route along high travel demand (the subway), many people would likely forsake the subway for their bike, especially in the older urban core where the TTC is less of a deal. And because of the subway, Bloor is the most equitable place for a bike lane, as merchants have a potentially greater number of patrons somewhat near them, and there’s a pattern of providing a lot of car parking atop the subway construction too. Our Bike Plan is behind, and in Arrears. So we don’t need Plan A as much as Plan B, for Bloor. Plan Bloor is pretty obviously a good idea from this two-decades-old mapping of cyclist origins and destinations, and this mapping also supports some of the north-south routes too, like University Ave. bike lanes, also atop a subway. Why do we not have any core part of Bloor with new bike lanes now? more than four years after first okaying a study of Bloor from High Park to Sherbourne? …Shows that clear pattern still along the main E/W streets, and not just Bloor. Left-hand passing in Bloor Yorkville. Here we see someone riding up along the left in Yorkville. 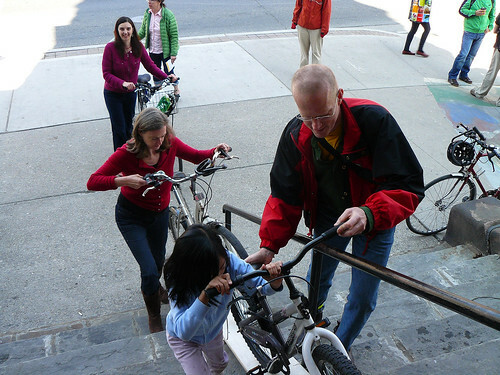 Check out Martin Reis’ photos from the Bicycle Blessing the other day. As part of the anti-bike Bloor rebuild in Yorkville, the merchants near Bloor and Yonge to Bay don’t like having bikes cluttering up their vision. So the well-used post and ring bike parking in front of Manulife is being ripped out and won’t be returned. Along with really brutal riding conditions, lousy design and substandard travel lanes in the construction zone, this is yet another way of discouraging bike use. Takethetooker is powered by	WordPress 3.2.1 and delivered to you in 0.334 seconds using 20 queries.